Like any superior system, P100 grout treatment is no doubt very cost effective. The cost compares favourably with the cost of alternative sealing methods. The differences are that P100 requires less time and that much fines passages can be penetrated and sealed. The positive sealing effect of P100 makes it possible for experienced personnel to predict the likely success that can be achieved after careful inspection and evaluation of each watermark problem. Contracts for water sealing can therefore be negotiated based on the success rate achieved. Mainly used in the sealing of porous areas in concrete and rock strata. Waterproofing of concrete type structures like tunnels, mine shaft linings and dam walls. Hard Rock. Soft Rock. Sandstone Sand. Isolating areas to be kept dry. Professionally trained and competent staff. The expertise to study geotechnical reports and design a pre-grout program to deal with an area prior to excavation, for shafts or decline locations, in order to minimize or eliminate water ingress at the time of construction. 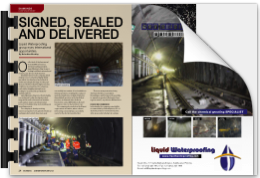 Research and development of new sealing technologies continuously on trial in the wettest underground sites in the world. High pressure grouting equipment and supplies. Remains flexible once solidified and will not re-leak with ground movement (400% elasticity).